Your search for the best bike multi tool on Amazon is over! 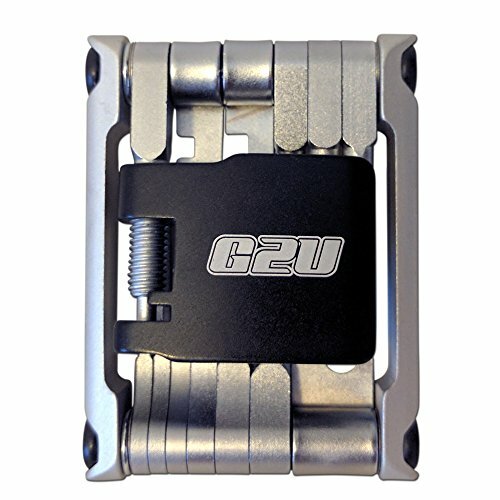 See for yourself the high quality built into each and every Geared2U Bicycle Multi-Tool and push the ADD TO CART button now! WILL NEVER BREAK - THE ONLY BIKE MULTI-TOOL YOU WILL EVER NEED! Premium grade Stainless Steel construction and high precision CNC machining process means this tool has the strength and quality you want and will always be there when you need it! EVERYTHING YOU NEED FOR EMERGENCY REPAIR OR QUICK ON ROAD ADJUSTMENTS IN THE PALM OF YOUR HAND! This super convenient tool has a chain breaker, 3 screw drivers, a tire lever, 6 wrenches (including 4 spoke wrenches), 5 allen keys and a can opener but takes no space and weights almost nothing. FITS ANYWHERE - in your pocket, hydration pack or in a bike bag. Makes it so easy to be prepared! BE THE ENVY OF YOUR FRIENDS! With it's stylish design and perfect machining your friends will want to know where you got it! If you have any questions about this product by Geared2U, contact us by completing and submitting the form below. If you are looking for a specif part number, please include it with your message.